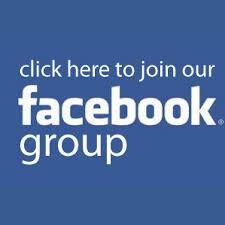 There are regular Dance Camps each year, in the UK and across Europe. 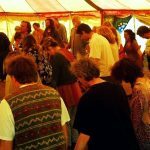 Many people finding their way to the dances for the first time, especially those without a local group, come to camp to connect to a bigger community of dancers from across the UK and experience dances from a wide range of traditions and leaders. A week-long camp pitched in a beautiful field surrounded by native trees and the rolling Chiltern Hills of Oxfordshire, is a wonderful holiday for adults, teenagers and children. The camp is closed (you are expected to arrive by Sunday and stay for the week, day tickets are unavailable). 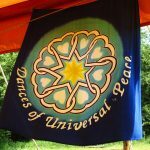 The Dances of Universal Peace are the main focus of Sacred Arts Camp. Daily sessions will be led by certified Dance Leaders. Voice workshops are also a major feature of the Camp. Other activities include Circle Dance, the Wave (5 rhythms), drumming workshops, Yoga, Tai Chi, sweat lodges, meditation, sharing groups, arts & crafts, and storytelling. Camping is in small circles of tents, around a communal fire with firewood provided. A busy programme of activities and events runs throughout the week, and venues include; a big top, marquees, yurts and tipis. Unicorn Village Camp is a series of four consecutive camps with a different theme as each camp’s focus – Voice Camp, Dancing Spirit Camp, Dancing Spirit Youth Camp and Constellations Camp. Spirituality is a many-splendoured love that we honour in all its forms. Hinduism through bhajan and yoga, Buddhism’s mindfulness meditations, Sufism’s healing practices of Ilahinoor and the danced prayer of zikr. We have Aramaic and more western Christian prayer, Native American Dance of Life, and Earth Magic too. Above all we have the Dances of Universal Peace, whose central purpose is to soften distinctions and differences that arise between people as a result of their convictions… and the universally popular Circle Dances from many European folk traditions. This camp can be enjoyed on many different levels: as a coming together of community and celebration of the Dances of Universal Peace. The camp also offers an opportunity for young people who would like to explore going deeper in leading the dances or playing music for the dances. Join Jilani, Glen, Daren and Maris for a four day celebration and exploration of the dances, walks, musicianship, voice practices, spiritual background, sufi meditation, breathwork and much more. Arriège Dance Camp in July, in Arriège, France. Dance camp is in French. Dancing Heart Camp in Latvia. Dance camp is in English, Latvian and Russian. 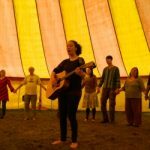 Spirit of Peace International Song and Dance Camp in September in Bavaria. Dances can be translated into English. German Dance Camp, in August. Dance camp is in German. Free tickets available to young people in the UK to attend the German Dance Camp under the Youth Exchange Programme. Free means the seminar fee is free, camping & food (and of course travel to Germany) would need to be paid. Czech International Dance Camp in July in Southern Bohemia. Camp is in Czech and English.